Parakeets, also known as budgerigars or budgies, are extremely playful and loving birds when raised and cared for correctly. A major part of caring for a parakeet involves comfort, such as handing him often, giving him toys to play with, sneaking him the occasional treat and setting up his cage and environment appropriately. Introducing a new parakeet into your home can be a frightening experience for your friend. The most important rules of taming are to be consistent and take it slow. For the first several days, leave him alone to get used to his new surroundings. Make no contact with your bird, besides to refill food and water. Then, move onto introducing yourself to him. 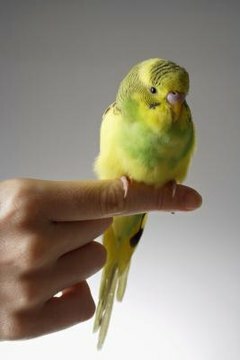 Put some bird seeds on your palm then slowly put your hand in your parakeet's cage to show him you are not a threat. Keep your hand in there for a few minutes; maybe talk or sing to him quietly in the mean time. Eventually move your hand closer and closer each time you visit him, extending a finger to give his belly a gentle rub. Although he may find your touch to be frightening now, he will warm up to you and eventually find your touch and presence to be comforting. Toys keep parakeets occupied and out of trouble. Parakeets love to play with all different types of toys, in and out of their cage. Toys that parakeets may enjoy include bells, shiny objects, swings, ropes, plastic keys on a key ring and wood blocks. It is important to rotate your parakeets toys, as well as to wash them with mild soap and warm water at least once per week to prevent illness. Make a new toy purchase once in a while to keep your parakeet interested. Although parakeets play alone quite well, try to include yourself in his play sometimes. When scared of nervous, parakeets may find comfort in a certain toy, almost like a security blanket. Besides your parakeet's regular diet of seeds, oats, leafy greens and pellets, he loves to indulge in the occasional treat. Especially when he is feeling scared or lonely, treats serve as a quick and effective means of comfort. Some parakeet treats include Millet spray, honey sticks, popcorn and fresh fruit like apple and grape slices. Giving your parakeet a treat should not be a regular occurrence. Only give your parakeet a treat every few days when he behaves, learns a new trick or is clearly uncomfortable in a situation. Consider placing your parakeet's cage in the corner of a room, or draping a cover over the back of the cage so nothing will be able to sneak up behind him. At night, place a breathable cover over his cage to block out lights and sounds. If you have to be away for longer periods of time, keep a television or radio on low volume for noise comfort. Spend at minimum 15 minutes each day socializing with your parakeet. Without any social interaction, your parakeet can become bored and get into trouble. It is recommended that you introduce another parakeet into your family so that your current friend will have a playmate. There is no set timeline for introducing an additional bird into your home, but be sure to keep the birds in separate cages in the same room for at least a month, as well as spend equal amounts of time with each bird. Should I Replace a Parakeet's Lost Mate?